Looking back at the first few years of working as a cardiologist at home in Qatar, is like watching an old movie. The scenes are clear, the events exciting, the struggles intense, and the heroes real. Some characters are still around; some are no longer with us. During the summer 1986, [Additional file 1]Dr. Gerald Redmond Garrett Prendiville, a 62-year-old Australian surgeon and Head of Orthopedic Department in our hospital (Hamad General Hospital) was driving with his wife in the middle of the day in Doha when his car had a flat tyre. While he was fixing the tyre, he had severe chest pain and could not finish it. Someone passing by recognized him and fixed the tyre for him. The pain subsided when he stopped working on the tyre. He was not sure what the nature of the pain was. He called Dr. Davidson, a physician in the department of medicine, and a common friend to both of us. Dr. Davidson advised him to see me. Dr. Prendiville came to my office the following day. I took a detailed medical history and examined him in my office. His chest pain was typical of coronary artery disease. I took him to the ECG laboratory. Resting ECG showed non-specific ST-T changes but the ECG stress test was positive. I started him on calcium antagonist and avoided beta-blockers because he was asthmatic. I wanted to perform coronary angiography the following day, but he requested to delay it because he had some important plans. He promised to keep me informed of his progress and that he will come to see me in a few days. As I walked back to my office I could not help recalling the days when I was a young boy in secondary school in 1961 waiting for Dr. Prendiville to see me in Rumaillah hospital. He was the doctor and I was the patient then. I went alone to see him because my English was good enough for communication. I was referred to him for tonsillectomy. After he looked at my throat, he booked me for surgery. I had no hesitation to let him operate on me because he had a very good reputation in Qatar then. He was loved and well respected in our community. I took the opportunity to tell him that my dream was to become a physician in the future. He said: "You should know that physicians die earlier than other professionals". I told him that "The age of dying is not of concern to me". I was too young then to think about longevity. I realized later that the statement he made was a myth. Over 40 years later, when Dr. Prendiville lived longer than his own expectation, I asked him if he remembered his statement about the life expectancy of physicians. He did not but he remembered that he operated on my tonsils. I could recall the post operation days while I was a kid hospitalized in Rumaillah hospital, the same hospital I worked in later as a consultant cardiologist. I had severe throat pain and some bleeding. Dr. Prendiville made rounds on his patients and visited me daily in the morning and in the afternoon during the three days of my hospitalization. He advised me to eat ice-cream post operation to stop the bleeding. We developed a mutual likeness for each other. I wondered if my plan to become a doctor had some impact and influence on the relationship. I was the only student in my school who had good relations with several other doctors in the hospital. All the physicians in Qatar were expatriates then. I used to visit some of them during the school holidays in their homes and in their offices when they were free. I invited a few of them to our house. They encouraged me to take up medicine as a career. They gave me a lot of information about medical schools. I was and I am still grateful for their help and advice. Many stories about Dr. Prendiville's skills and knowledge circulated in living rooms in Qatar. Some of the stories got modified and exaggerated as it narrated from one person to another. I heard one such a story once from our driver who worked for the hospital before. He told me that a trauma patient was brought to the hospital with his head broken to pieces. "The new tall English doctor put back the pieces of the brain and the skull together. The patient was talking the following day". Many illiterate people like our driver had never heard of Australia then, so they referred to Dr. Prendiville as the "English doctor". I did ask one doctor about that case. He told me that the patient had a very small skull injury that required only a burr hole for evacuation of blood. Soon Dr. Prendiville became a legendary surgeon in Qatar. I have mentioned him in some of my previous articles. In the article about Sheikh Abdulla Al Ansari, I mentioned that Sheikh Abdulla narrated to us a heroic action by Dr. Prendiville who saved his father's life. Sheikh Abdulla's father stopped breathing while recovering from anesthesia post operation. Dr. Prendiville succeeded in getting him breathing again. In gratitude, Sheikh Abdulla gave the surgeon a golden Rolex watch. Swiss watches were the most popular gifts that rich Qatari patients gave to doctors in appreciation of their care (Heart Views Vol.1, No.8 P325-329). Dr. Prendiville, who had special training in orthopedics, worked in Rumaillah hospital as a general surgeon. He was the first trained surgeon who came to work in Qatar. All the other surgeons in the hospital then worked as his assistants. The hospital had 120 beds, and was one of the best hospital buildings in the whole Gulf region at that time. He worked first as a locum surgeon for 6 months in 1957, four months after the opening of the hospital [Figure 1]. On his first trip to Doha in 1957 Dr. Prendiville said: "In the airplane I came on from Bahrain, there was myself, my wife, a little baby and another baby in the carry-cot. We had the whole plane to ourselves. There was no airport, no airfield, but just landed in the desert". Once, Dr. Prendiville showed me some photographs he took in Qatar in 1957, such as traders carrying their goods on donkeys on the north road [Figure 2] and his involvement in tuberculosis (TB) surveillance in Qatar that year, using a car equipped with an x-ray machine [Figure 3]. He also witnessed small pox inoculation in Qatar villages [Figure 4]. Dr. Prendiville came back to Doha later as a regular employee for 12 year from 1961 to 1973. He operated on several of my friends and relatives. He operated on every part of the body. For example, he operated on my father's hemorrhoids, my tonsil, my cousin's intestine, and performed circumcision on my brother. I said in a previous article "If Dr. Prendiville was not the man for all seasons in Qatar, he was certainly the surgeon of all organs then". In fact as a general surgeon he did more that general surgeons are expected to do. He did all the caesarian surgery for the Women's Hospital. The Women's Hospital had only one doctor "Hamda" who had no surgical training. Dr. Prendiville said: "All I had to do was to perform the caesarian." On a few occasions, Dr. Prendiville came to our house as a social visitor to visit my father. My father loved to ask people about their country and their food and habits. I enjoyed the role of a translator in such situations. Qatar was a British protectorate since 1867. Most of the heads of departments were British or recruited by the British. There was a British "advisor" office handling some of the administration for the government of Qatar. The processing of Dr. Prendiville's recruitment was handled by the British advisor office for the Government of Qatar [Figure 5]. During the 1950s and 1960s the British were helping in running the semi-primitive health care of Qatar. Modern western medicine was new for Qataris then. During that time the Qataris were satisfied with the relatively modern medical care compared to the old Arab traditional medicine. They were very cooperative and accepted the treatment offered locally. But that situation changed rapidly in 1971 when Qatar became independent and a ministry of health was created. Requests for treatment abroad suddenly jumped beyond control that year. Some citizens wanted to see the outside world as tourists on the government's expense. Any official who wanted to be popular must send people abroad for "treatment". The treatment abroad committee was reformed and Dr. Prendiville was appointed as the chairman. The medical board committee would write: "Treatment abroad is not recommended," but the patient was sent abroad by the minister of health anyway. Dr. Prendiville recalled. "It became chaotic and the hospital was devastated. Patients came to us requesting referral abroad instead of treatment. Some patients wanted to go abroad for treatment for truly minor problems like a cyst on the back. When we refused to send a patient with a minor problem abroad, the minister overruled our decision." Dr. Prendiville had been happily performing first class surgery for four years in Qatar but suddenly found it difficult to convince many patients to accept surgery or medical care in Doha. Medical and surgical care suffered. It was difficult for a professional surgeon to work in such an atmosphere. "I had been to Sheikh Khalifa (The Crown Prince) to ask him if anything could be done to stop what was happening and to tell him of the difficulty I had in being part of such an organization. He was sympathetic but explained to me that Sh. Abdul Aziz had been appointed Minister of Health and that it did not come within his authority. I thought about it for a while and told Sh. Khalifa that I regretted it, but I was not willing to continue. I submitted my resignation. By a quirk of destiny, my wife and I had said our farewells, packed our belongings and set off to drive across Saudi to Beirut, Lebanon on our way to London on the 20th of February 1972. We arrived in Beirut on the 23rd. Seeing the Qatari licence plates on our car, people came up to us and told us of the coup and that Sh. Khalifa was now The Ruler. Dr Berbeir (a Lebanese doctor connected with the Qatar Ministry of Health) contacted us and treated us as honored guests. Through him I was soon in contact with Dr Gotting who had been appointed Director of the Medical Department and through him to Sh. Khalifa. So I came back to Doha with a great welcome home. Sh. Khalifa's succession as Ruler on the 22nd of February 1972 was a dramatic one". On November 12, 2006 I told HH Sh. Khalifa that I was writing an article about Dr. Prendiville and that Prendiville claimed that he stayed in Qatar because of his support. HH told me: "That is true. When I became the Amir, he had left the country because he was not treated well by the minister of health. I sent him a message to Beirut that I apologize for the mistreatment and asked him to come back. He came only because I asked to come back". So Dr. Prendiville continued working in Doha until 1974. When I completed my training in the USA and returned to Doha to work in 1978, I did not find Dr. Prendiville in Rumaillah hospital. I was told that he went back to Australia for good five years before my return. I heard over the years, on many occasions, from several senior Qatari citizens, praise for Dr. Prendiville's work in Qatar in the 1960s. I never heard any negative comment about him. Many Qataris described him with admiration as: "Friendly, fair, honest, skillful and a real doctor". He also liked the Arabs and took evening Arabic lessons to be able to communicate with them. He sympathized with the Palestinian tragedy. He showed me a copy of his letters to Australian newspapers defending the Arabs against unfair editorials. Almost daily the conflict between Israelis and Palestinians in the remaining Palestinian territories in the West Bank and Gaza Strip features in our newspapers and on TV screens. The TV screens show us the rubble and waste land that is now much of Palestine but the commentaries, apart from occasional instances carry a different rhetoric. "Mr. Sharon has declared" no negotiations whilst blood is being shed. "But whose, and where, and for what? The vast majority of the blood is Palestinian and is being shed in Palestine . . .
During his stay in Qatar, Dr. Prendiville witnessed several political, medical, monetary and administrative changes. He witnessed for example several currency changes. The first salary he received in 1957 was with Indian Rupee [Figure 6] & [Figure 7]. For many years the Indian rupee was the official currency in several areas that were controlled by the British and governed from India; areas such as East Africa, Southern Arabia and the Gulf. In May 1959, The Indian government introduced the Gulf rupees as a separate currency for the Gulf to reduce the strain put on India's foreign reserves by gold smuggling. In 1966 Dr. Prendiville was paid in Qatar-Dubai riyals. The Gulf States started their own currency because in 1966 India devalued the Rupee. Qatar and Dubai jointly issued Qatar-Dubai riyal. In 1973 Dr. Prendiville was paid with a new currency, i.e., the present Qatari riyal (QR). During all these changes the Indian rupee, the Gulf rupee, Qatar-Dubai riyal and the Qatari riyal kept exactly the same value. The Indian Rupee was the currency I knew during childhood. But we used to call the Rupee in Arabic Rupiya or Rupya probably the way we heard it from the Indians. Webster Dictionary states that the origin of the word Rupee is found in the Sanskrit (Hinduism, an ancient language of India) as rupya meaning 'silver.' Rupee was divided into 16 annas, and the anna into 4 pice (piza). I remember that in 1956, an illiterate woman in our neighborhood wanted to write a letter to her husband abroad. She dictated the letter and I wrote the letter for her. She paid me a fee of 4 annas (1/4 rupee). It was the first money I earned on my own. In 1981 after I was appointed Undersecretary of Health, I went to Australia with a team upon the government of Australia's invitation for health cooperation. During that visit we signed an agreement with Australia to staff and run the Geriatric and Rehabilitation Centre in Qatar. We visited several parts of Australia including Perth in Western Australia. I managed to find Dr. Prendiville in Perth, his hometown. He was working in a private hospital. He invited me and the team to his house for lunch. I reminded him about his relative good days in Qatar. I told him that he should return to Doha because he was loved by the people of Qatar. I made an offer to him. After he discussed the issue with his wife and family, he told me that he accepted my offer. I felt a hero for recruiting him again. So he came back to work in Hamad General Hosptial for another seven years from 1981 to 1988. Going back to Dr. Prendiville medical history, . . . he came to see me three days after the stress test. He had no symptoms on medical therapy. He told me that before the chest pain he had planned to go to Kenya to spend a few months and visit some African countries. I advised him against it. I told him that I was preparing to go to Perth for interventional training that year. He promised to be there at the time that I would be in Perth. He went to Africa and 2 weeks later he went to Perth. At Royal Perth hospital my friend, Dr. Bernard Hockings, the cardiologist who arranged for my interventional training there, arranged to perform coronary angiography for Dr. Prendiville. I joined Dr. Hockings in the catheterization laboratory when he performed the coronary angiogram. Dr. Hockings worked with me in Doha for few years before as a consultant cardiologist. He was very smart and hard working. He also knew Dr. Prendiville personally. The coronary angiography confirmed that Dr. Prendiville had severe CAD. Since that time, he underwent about 14 coronary angiographies or angioplasties, with 13 stents, one retroblator and one bypass surgery. He returned to Doha but visual problems such as retinal detachment prevented him from operating on patients. In 1988 he resigned due to ill health and returned to Perth. In May 2001, I invited him to visit Doha to see his medical colleagues. I made a dinner party for him in my house where I had a chance to hear more about his past history in Australia and in Qatar [Figure 8]. 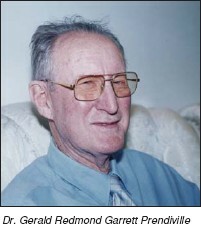 He was born in May 1924 in Perth and had his "matriculation" in 1941. He went to Medical School in Melbourne, Victoria. It was four days away by rail from Perth at that time. Between 1943 - 1946, he had to do war service in the army. He had asthma and migraine since childhood. He smoked only for 2 years while he was a soldier in the army. During World War II his brothers and his friends went actively in the war, mainly against the Japanese, while he was hospitalized for TB in 1944. His brother was killed and a lot of his friends were killed and he was saved because of his TB. He had renal TB during the time he was soldier in the army in 1944. One kidney was removed. Four years later (1948) TB was found in the other kidney. The urine culture had pus. He was treated successfully at that time with Streptomycin which was discovered recently in 1943. When he was re-hospitalized for TB in 1948, he was in medical school. The way they were doing the urine tests for TB at the time, were by culture and injection of the patient's urine into guinea pigs. The culture result took a long time, and the guinea pig test possibly was more reliable. They injected the urine into the intraperitoneal cavity of the guinea pigs and observed them over 3-4 weeks. If the animals became sick and died they were autopsied. If disseminated TB was found, then the test is positive. So he said he was in the hospital watching the guinea pig labelled with his name and another one in the name of a friend hospitalized for TB also. "We were going and watching the guinea pigs which were put in cages in the hospital. Three weeks later after the injection, the guinea pigs became weak, weaker, weaker, and very sick", he said. His problem with TB haunted him for many years. In1980 doctors thought that he had cancer with metastases in the ribs when he became very thin and malnourished. However, there was no metastasis and all tests were negative. As no definite diagnosis could be made he was put on anti-TB drugs. He regained his weight and was cured. Six months later a urine culture for TB which had been overlooked was found, it was positive for TB. After a total of 6 years in medical school he graduated in 1951 and had internship and residency in Melbourne before going to the UK for general surgery and orthopedic training. In 1957 he obtained his FRCS. He then came to Doha as a locum consultant for 6 months before returning to work in Australia as orthopedic surgeon during 1958-1961. "I was looking for a way to pay the fares to get to home in Perth. The only way of getting there for me was by sea. It would take 3-4 weeks to get there and it was very expensive. So I applied for a job as a ship surgeon. Then I saw an advertisement for a locum wanted in Qatar. I had no idea where Qatar was. Nobody could tell me anything at all about Qatar. Anyway I applied and got the job. One condition was that they fly me home at the end of my locum to Australia. That was done". Before his trip to Qatar he looked through the Encyclopedia Britannica to find information about Qatar and found one paragraph: "Located in the Gulf and had been an aim for pirates in 18th and 19th centuries. There was a town called Wakrah and another town called Doha". So when he arrived in Doha, he felt that he was coming to a complete new world. "I had heard of Islam but never met a Muslim for instance. When I arrived here I found to my delight that everyone here was like anyone else in the world except that they were so polite and so nice. When I was shown the hospital I was absolutely delighted because it was situated out of the city, away in the desert. Doha ended at the Mannai round-about then, and the road to Rayyan passing the Rumaillah Hospital was still unsealed. The people were actually complaining about how difficult it was to get to Rumaillah Hospital then, because they couldn't walk there, and couldn't get a donkey up there, they had to get a car". Dr. Prendiville was requested to stay on in Doha after the locum period by Sheikh Khalifa Bin Hamad Al Thani, the Crown Prince then, long before he became Amir of Qatar. He offered him 6000 Rupees per month while a senior surgeon was paid only 4200 Rupees per month then. Dr. Prendiville did not accept the offer because "I knew I did not have enough surgical experience to justify my accepting his offer", he said. "But when HH Sheikh Khalifa sent me a cable in 1961 asking: Would you like to come back to Doha? What salary would you require?" I thought, "This is a good offer, too good to resist". He added that he asked for 8000 Rupees and got 7000 a month. It was the highest salary for a surgeon in the Arabian Gulf then. Money was not the only reason Dr. Prendiville accepted the offer. Doha was another reason: "I loved it. It was small, compact, friendly. It was possible to know almost everybody - Qataris, non-Qataris and expatriates. It was so small. Social life was so close and emotionally fulfilling. It was a very, very nice place to be. And in addition, of course, there was this marvelous hospital and 60 beds in it, all mine as chief of surgery and I could do what I liked with it." Dr. Prendiville added that "Rumaillah hospital opened in 1956 and was made available to anyone who could get there - Qataris and non-Qataries in Qatar and from outside Qatar; People from the Gulf, from Aden, Abu Dhabi, Dubai, from India and Pakistan, etc". Life was simple then and the door to the ruler's house was open for help. "Whenever we wanted something in the surgical department and could not get it through the routine manner, I could go to either Sh. Khalifa or to Sh. Ahmed. Sh. Khalifa was the "Wazeer" and was creating the administrative infra-structure and in addition I appreciated that I had been appointed by Sh. Khalifa himself and with Sh. Ahmad's approval", he said. The ruler's palace was not far away from the hospital. "I could walk down on the street to where Sh.Ahmed had his palace and ask at the gate "may I speak to Sh.Ahmed" (the Ruler). Then I would say "We need such and such, and I am not sure how to get it" He would consider the request and if he had no objections he would agree and the next day the order would go through and whatever I requested would arrive." When Dr. Prendiville left Doha in 1988 he was not well. He had problems with CAD and retinal detachment. In 1993 he had prostate cancer and it was removed surgically. He was also told during that time that the blood test showed chronic lymphocytic leukaemia which became myelomonocytic type later. H - Dr. Prendivvile, how is your health now? P - I have a little bit of Leukaemia but it is not bad. H - Did you have more stents since the last one, about 10 years ago? P - Yes, 12 more. H - I know that you had coronary bypass surgery. When was that? P - It was in 1994. H - Dr. Prendiville, when you came to Doha 1957 for a locum, why did not you stay longer? P - Sh. Khalifa asked me to stay, but I did not have enough surgical experience to deal with all problems coming in Doha. H - But you were the most senior surgeon in Doha at that time. P - That is right. Yes, the others before me were terrible. I say that quite clearly. H - Were you scared at that time to operate on ever thing from head to the bottom? P - No, not scared. I was a surgeon for 7 years before that. H - How long did you stay in Doha? H - No. It can not be, because I used to visit you in Rumaillah during the years when I was in high school. P - That was later. I came back in 1961 until 1974. H - I succeeded in getting you back to Doha in the eighties. P - Yes, in 1981. H - Would you join us in Doha again? P - Well, I think that I might be a little bit slow now. You probably could do better without me. H - I, honestly, look at you like a father. I remember you from the days I was a student. As I grow older I become more sentimental about the past. P - Me too. Yes I can cry over Doha too. H - When you talk about Doha, what comes to your mind most? P - My interaction with Sh. Khlifa Bin Hamad. In 1957, a boy, the son of Sh. …[close relitave of Sh. Khalifa] was playing with a dynamite. It exploded and he had compound fracture of the femur and compound fracture of the ulnar with nerves sticking up and the arm almost detached. Sh. Khalifa wanted to send the child to Lebanon. He did not agree that I operate on the child. I convinced Sh. Ahmed, the son of the ruler then, Sh. Ali, that the child was in shock and should stay in Doha for treatment. Sh. Khalifa then got back and said: "Ok, but if the child dies I will cut your foot". When the child survived, 4-5 weeks later, Sh. Khalifa became my friend. (HH Sh. Khalifa confirmed Dr. Prendiville's story later and told me that the child was Hamad, the son of his brother Abdulaziz. Hamad died later in Europe. I asked HH why he threatened the doctor "to cut off his foot." He said: "I was only joking with him"). H - Do you remember any other story? I wish you would write them for us. P - A story where I am a hero is not history. What I write is a history of me. H - Yes , but it is also the history of medicine in Qatar. P - I have to run now. I am studying music at the university. H - That is very nice. You are a man of all season and a doctor of all organs. P - Now I am a conductor of music. H - Take care Dr. Prendiville…good bye. P - Good bye Dr. Hajar. As usual I look forward to receiving an email from you at this time of the year and it is a pleasure to send you a reply, but not this year. Age-related diseases are catching up with us. I arranged for all my children, grand children and my beautiful little great granddaughter to stay at a beach resort 200 meters from the beach and a short walk from our home. My dear wife also has her problems with arteries. I look forward to an interesting and unpredictable time but finally "Allah Kareem" (i.e. God is generous.. the Arabs may say that when they are in a hopeless situation). Please give my best wishes to the surgeons I was privileged to be able to help. My best wishes to you and your family. "I had a telephone call from Shaun Prendiville to say that Red had died today and he asked me to pass the news on to you".
" Dr. Prendiville wanted to die because he did not want his life to be a burden to others".